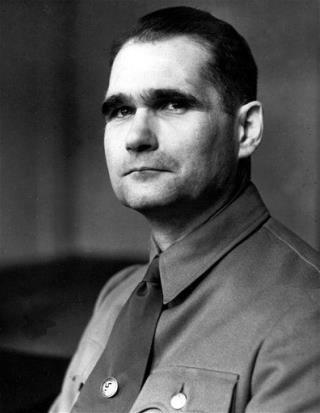 (Newser) – The man who hanged himself at the age of 93 in Berlin's Spandau Prison in 1987 really was Rudolf Hess, Adolf Hitler's former deputy, DNA tests have confirmed, quashing a conspiracy theory that persisted for more than 70 years. Researchers trying to prove that the Nazi was not replaced by a doppelganger tracked down a Hess relative in Germany and compared his DNA to a blood sample provided by Spandau's Prisoner No. 7 in 1982, the New Scientist reports. Testing revealed that there was a match of almost 100%. Conspiracy theorists, including W. Hugh Thomas, one of the doctors who treated Hess in prison, had suspected that an impostor replaced Hess before he flew to Scotland in 1941 in an attempt to negotiate peace with Britain. The war on Nazism.. A Childish infatuation.. Up there with the Big Bad Wolf and Wicked Witch of the West.. Something to distract the stupid.. ..
Newser could use a "who cares" voting choice.